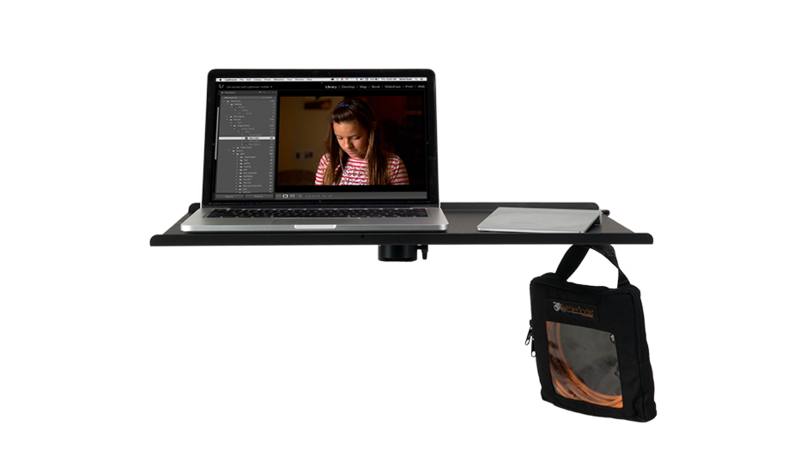 The Tether Table Aero was designed to meet the needs of not just photographers, but all creative individuals looking for a portable table and tethering solution. It’s sleek in design and unsurpassed in stability and durability. Featuring the state-of-the-art LAJO-4 ProBracket, Aero Tables fit perfectly on all standard lightstands and tripods. Move your mouse over the plus signs to see the great accessories available for the Aero Table. The Aero XDC, XDC Mini and XDC Duo are the ideal eXternal Drive Compartments to use with any Tether Table Aero. The XDC frees up valuable space on the Tether Table due to its low-profile sleeve which mounts under the table’s surface. The Rock Solid Utility Arm, used in conjunction with a Rock Solid Master Clamp (sold separately or as a kit) or any clamp with a 5/8”(16mm) Hex receptor is the perfect studio or location solution to keep gear conveniently located and easily accessible. Developed for the Tether Table Aero System, the holder slides on to any flat edge of the Tether Table Aero. It can be easily repositioned or removed as needed. The Tether Tools Aero Utility Tray is the perfect studio and location accessory to secure generators, batteries, servers or any needed equipment on a tripod or light stand. The Aero Utility Tray includes the Aero Utility Tray and Arm which connects to a Master Clamp (sold separetely) or any clamp with a 5/8″(16mm) receptor. The Rock Solid Master Articulating Arm is a fully adjustable arm designed for positioning a tablet, small monitors, camera, light, flash and many other accessories in the optimal position. Accessorize the Tether Table Aero with the convenient Aero Cup Holder. Ideal for those chilly sunrise photo shoots where a warm beverage is needed or those long days on location and staying hydrated is a must. Ever wish a tripod had arms so it could hold more than just a camera? Now it can. The StrapMoore is a handy contraption that secures to the leg of any tripod, light stand, pole, beam, table, chair and much more. The StrapMoore’s interior GripperElastic® straps enable one to secure just about anything needed near a camera or computer. Accessorize the Tether Table Aero with the convenient Aero Clip-On Hooks. Simply push the hook onto any flat edge of the Tether Table and you are ready to go. Which Table is Right for You? 16″ (40 cm) x 14″ (35 cm). 2.5 lbs (1.13 kg). Available in brushed silver and non-reflective black. 18″ (45 cm) x 16″ (40 cm). 3 lbs (1.36 kg). Available in brushed silver and non-reflective black. 22″ (56 cm) x 16″ (40 cm). 3.5 lbs (1.58 kg). Available in brushed silver and non-reflective black. Mac specific tables are optimized to the dimensions of the MacBook and iMac. They create the most streamlined table size for each Mac. If you are looking for additional table space next to your Mac, please see the Standard sized tables. All accessories work with Standard and Mac specific sizes. 14.75″ (37.46 cm) x 10″ (25.4 cm). 2.5 lbs (1.13 kg). Available in brushed silver and non-reflective black. 16.25″ (41.275 cm) x 10.82″ (27.50 cm). 2.50 lbs (1.13 kg). Available in brushed silver and non-reflective black. 17.50″ (44.45 cm) x 11.50″ (29.21 cm). 2.5 lbs (1.13 kg). Available in brushed silver and non-reflective black. 22″ (56 cm) x 16″ (40 cm). 3.5 lbs (1.58 kg). Available in brushed silver.